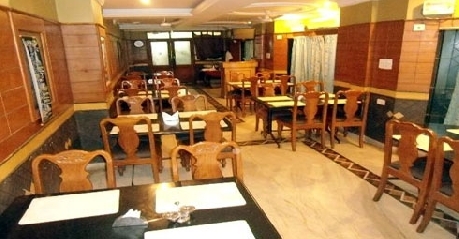 Located at Pudukkottai in Tamil Nadu, Hotel Royal Park is the premium budget luxury hotel. The hotel is the first preference for both leisure and pilgrims travelers due to its unmatchable services and warm hospitability. All the 47 fully-equipped rooms are designed lavishly and have been categorized into rooms and suites. All these rooms and suites come with hosts of facilities including International standard running hot and cold water supply. The well-appointed meeting hall is also offered by the hotel ideal for organising meetings, conferences and events. An array of facilities are offered by the Hotel Royal Park that includes browsing centre, in-house laundry and dry-cleaning service, beauty parlour, covered car parking, email and fax facilities, direct dial STD/ISD, CCTV with satellite programme, outdoor catering, doctor-on-call, European plan and American plan, local sight-seeing, MM/AC business hall, round the clock room service, group booking specialities, travel desk, 24-hour check-out time, Singapore Muthaya restaurant and 7th sense bar. Royal Mini Suite is ideal for business travelers as it is equipped with all the modern amenities. The elegant interior and subtle use of colours make the suite an ideal place to stay. Complimentary breakfast from 8am to 9am is also offered within the suite by the hotel. Some of the other facilities include television, laundry service, ironing service, International standard running hot and cold water supply, direct dial STD/ISD, round the clock room service, 24-hour in-room dining, air-conditioning and doctor on call. All the Superior Deluxe Tripple rooms are tastefully designed fully-equipped with all the latest amenities. These fully air-conditioned rooms offer state-of-the-art facilities to ensure a comfortable and luxurious stay of its guests. Some of the noteworthy services are offered within these rooms that include laundry service, 24-hour room service, direct dial STD/ISD, television, luggage space, doctor on call, ironing service, 24-hour in-room dining, International standard running hot and cold water supply and complimentary breakfast from 8 am to 9 am. The well-appointed Executive A/C rooms offer each and every necessary facility to make the stay of its guests comfortable. These rooms are designed in simple and elegant manner so as to provide utmost relaxation. Guests during their stay can avail an array of facilities such as complimentary breakfast from 8am to 9am, direct dial STD/ISD, International standard running hot and cold water supply, ironing service, doctor on call, round the clock room service, luggage space, television, laundry service and 24-hour in-room dining. 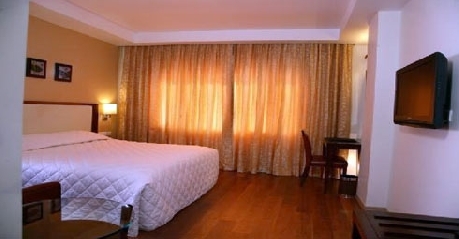 The well-furnished Superior Deluxe A/C rooms offer outstanding services to its guests. The walls of these rooms are painted with subtle colour so as to maintain the simplicity of the room. Round the clock room service, television, ironing service, doctor on call, 24-hour in-room dining, laundry service, direct dial STD/ISD, luggage space, International standard running hot and cold water supply and complimentary breakfast from 8am to 9am are some of the facilities offered by the hotel in these rooms. The Executive Non A/C rooms are simple rooms infused with all the necessary amenities. These rooms are ideal for budget travelers who are looking for a comfortable stay in low budget. Some of the services offered include direct dial STD/ISD, round the clock room service, in-room dining, laundry service, complimentary breakfast from 8am to 9 am, ironing service and doctor on call. These lower budget fully air-conditioned rooms are best suitable for those travelers who are looking for decent rooms at a lower price. Guests can avail basic amenities like doctor on call, direct dial STD/ISD, complimentary breakfast from 8am to 9am and round the clock room service. All the Non A/C rooms are very affordable rooms offering basic facilities to its guests. Room service, complimentary breakfast from 8am to 9am, direct dial STD/ISD and doctor on call are some of the basic services offered in these rooms. Singapore Muthaya is the in-house restaurant of the hotel offers mouth-watering food from different cuisines. Guests during their stay can enjoy delicious food and their choice of drink with their family, friends and loved ones. The hotel also consists of a well-stocked bar where the guests can savour a vast variety of alcoholic as well as non-alcoholic beverages along with an array of lips-smacking snacks.